Review Summary: Accept continue to be at the top of their game, and release an album that is more than just blind rage. Accept is one of the most interesting bands within heavy metal. Their roots can be traced all the way back to 1968, when they were still known as “Band X”, at a time where Led Zeppelin had just managed to get their first record deal and Black Sabbath were still recording their debut. However, it wasn’t until 1983, during the heyday of European heavy metal, that Accept finally got accepted into the mainstream with their album Balls to the Wall. Fast forward to 2010, and after the loss of longtime vocalist Udo Dirkschneider, Accept somehow manages to bolt back up with their first album in fourteen years, entitled Blood of the Nations. Two years later, the release of Stalingrad is also a critical and commercial success, showing that Accept are fully capable of matching their early work and making a spectacular comeback. And now, the year is 2014, the album is Blind Rage, and the band is still going strong. On the instrumental side of things, guitarists Wolf Hoffman and Herman Frank nail their compositions perfectly, from the acoustic intro/buildup in “Wanna Be Free” and “From the Ashes We Rise” to the simple but undeniably catchy riffs in “The Curse” and “Fall of the Empire”, to the epic soloing of “200 Years” and “Dying Breed”. Meanwhile, bassist Peter Baltes and drummer Stefan Schwarzmann play right along, making do with the supporting roles of their instruments. And, after just two albums with the band, vocalist Mark Tornillo somehow still manages to pose a worthy match to Dirkschneider, with a style sounding like a combination of Bobby Ellsworth and Brian Johnson. Lyrically, the music is just generic heavy metal banter, but it works fine for what it is. The occasional symphonic elements and gang vocals also help to create a more “epic” feel to the songs. Production-wise, the album is in the sweet spot, where it doesn’t sound too raw or too overproduced, and the instruments are all fairly equal to one another in the mix, although it might’ve helped to put the bass just a little louder. The album is around an hour long, which could be a turn-off for some, but there’s never any real drag or a monotonous feel to the music, which is one of the best things that can be said about it. After all, there are few things worse than a heavy metal record that fails to capture the interest or energy of the listener. And that’s the biggest strength of the band as a whole: They still have energy. It may be somewhat redundant to draw comparisons to Overkill’s new album, but just like Overkill, Accept have risen once again to prominence after a decade or two of obscurity, and have come back swinging. In a world completely clogged by countless subgenres such as black, power, death, thrash, folk, doom, sludge, and “djent”, sometimes it’s nice to kick back to a simpler time. 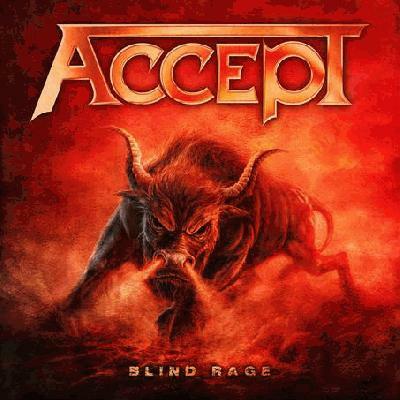 And with Blind Rage, Accept have not only paid tribute to their older material, they’ve surpassed it. Available for streaming on Spotify. As always, feedback is much appreciated. Yes, it will, Lloyd. Yes, it will. Woah woah woah good review but "Accept have not only paid tribute to their older material, they’ve surpassed it"? I haven't heard this yet but... are you serious? Without counting the singles, I heard a bit of "Fall Of The Empire" and it ruled, though. doubt this is as strong as a 4.0  tbh, but I'll listen surely. Alright, maybe that was a little overboard, but this is really damn good. Great review man, pos. I was planning on writing something about this album but you did a good job so I won't bother. The best things about this one are definitely the guitars, the vox and of course the production. However, I feel that the album would have been stronger and more focused if it was something like 10 minutes shorter. I think it's somewhere a 3.5 for me. Yeah these new albums (2010-2014) are a bit too solid at times, imo. Thanks, manosg. Yeah, it started off as a 3.5 for me but eventually grew up to a 4. Yeah the new albums are pretty solid but they can't touch their 1981-84 work for me. I guess it's the same deal with Overkill, really. Their new stuff rules, but you can't hit Horrorscope or YOD levels yet. I really enjoyed Stalingrad a lot. Blood of the Nations ruled as well. Great review, need to check this out! No problem! Yeah for some reason I was late to the In Absentia party, finally picked it up and it's amazing. "Blood of the Nations ruled as well." Awesome review, per usual! You've been pushing out some seriously solid reviews the past week.